The "INN" part of the sign is not in doubt.. The Daleyville is iffy, although there is a Daleyville, Wisconsin. This image is behind mat and glass, but is UNCASED. The dims of the entire piece are 4.25" x 3.25". Overall it's in excellent antique condition with no bends. 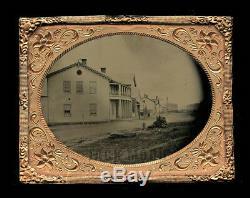 The item "Tintype Photo 1860s Civil War Era Outdoor Town Street Scene Signs Pedestrians" is in sale since Tuesday, January 1, 2019. This item is in the category "Collectibles\Photographic Images\Vintage & Antique (Pre-1940)\Tintypes". The seller is "jack_mord" and is located in Woodinville, Washington. This item can be shipped worldwide.